Kratom is a tropical tree native to Southeast Asia. Consumption of its leaves produces both stimulant effects (in low doses) and sedative effects (in high doses), and can lead to psychotic symptoms and psychological addiction. The psychoactive ingredient is found in the leaves from kratom tree. These leaves are subsequently crushed and then smoked, brewed with tea, or placed into gel capsules. More recently, products containing kratom have been sold as ‘incense’ and aphrodisiacs in gas stations and adult stores. At low doses, kratom produces stimulant effects with users reporting increased alertness, physical energy, and talkativeness. At high doses, users experience sedative effects. Kratom consumption can lead to addiction. 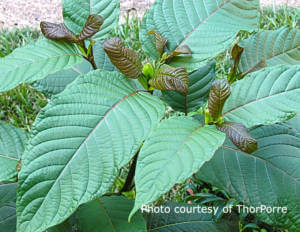 Several cases of psychosis resulting from use of kratom have been reported, where individuals addicted to kratom exhibited psychotic symptoms, including hallucinations, delusions, and confusion.